Gratings are a very powerful instrument in contemporary science, and many applications rely on them. They also seem to represent one of the ultimate proofs that light is indeed a wave. Concepts like wave length, diffraction, constructive and destructive interference, which are assumed to be present at the use of one slit or a double slit, come back with a vengeance. The problem with such experiments is they are usually done with monochromatic laser beams, and their interpretation remains abstract and very difficult to falsify. For those who have little knowledge of gratings and their uses, this Youtube clip by two youthful nerds might give a first idea what it is all about. Just as by the Double slit Experiment, I would like to bring the discussion down to earth by presenting two pictures that I took with the same pinhole lens I used before, and one with a slide of a grating of 500 lines per mm. 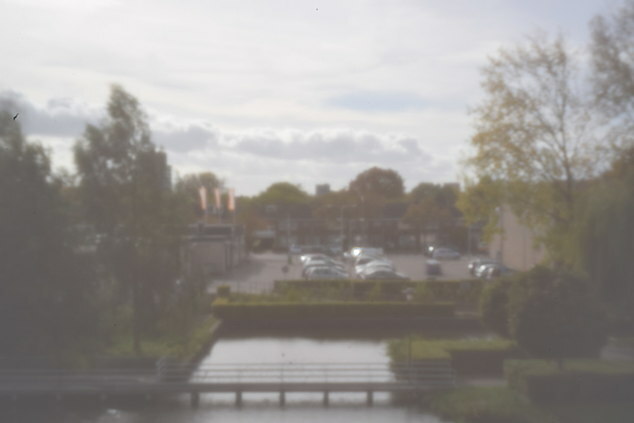 The exposure time was for both 1 second, but since it was an outside scene, that is only an indication without any scientific value under non-controlled conditions. 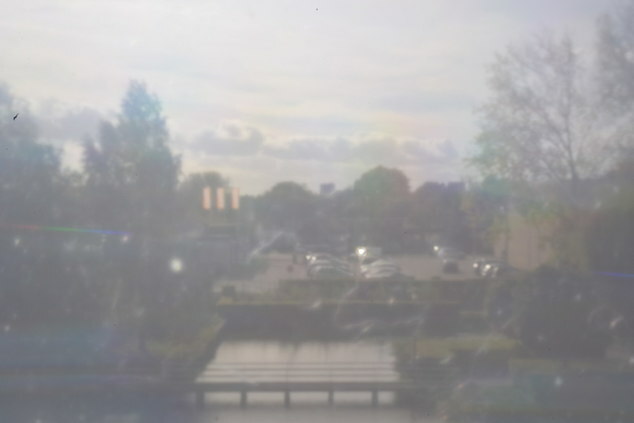 What is certainly striking is that in the picture with the grating taped to the pinhole lens, we do not see the lines at all! In fact, except for the brightness, we would be hard put to indicate any fundamental differences between them, unless it would be the colored stripe in the middle of the left edge. I think that those pictures show how biased the explanations are, trying to fit the facts to the theory. I will soon present pictures with the same setup, but then instead of an outside scene, I will use a laser pen as a light source. 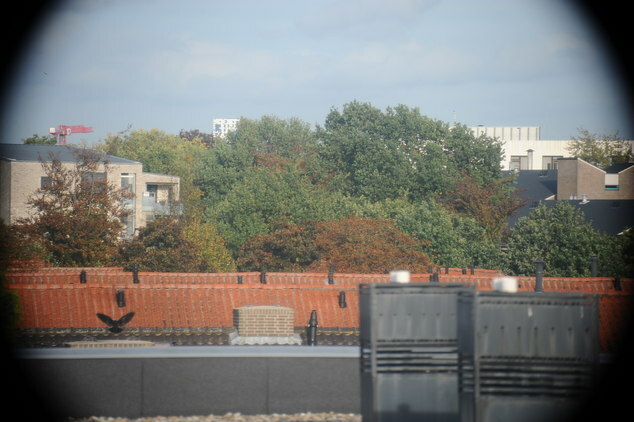 How easy it is to make gratings disappear is shown here with the following two pictures taken from the upper floor of my building. The black circles, vignetting, is due to the fact that I am using a so-called DX objective, one made for crop cameras, with a full frame body (24x36 mm). The vignetting can be safely ignored. 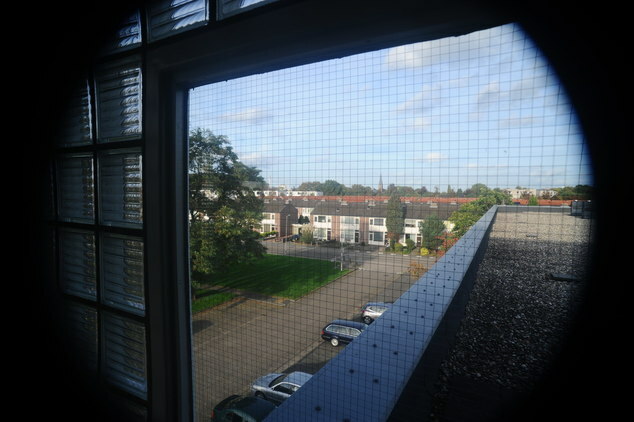 The first picture is taken with the zoom set on wide angle 20 mm, while in the second it is set at the telelens position of 270 mm.